In Huntington Beach, aka Surf City USA, life just naturally revolves around the beach. With 8.5 miles of beach and some of California’s best natural surf breaks, it’s easy to understand how the city got its nickname. Visitors who haven’t yet mastered surfing can worship the pros at the International Surfing Museum or the annual US Open of Surfing. Surfers and spectators alike will enjoy breathing in that salty ocean air and viewing Huntington Beach’s natural beauty. Of course, in order to do so, you need to have healthy lungs. Minimize your chances of lung disease due to asbestos exposure in your Huntington Beach home with help of AQHI, Inc. The experts at Advanced Quality Hazmat Industries can handle your asbestos removal in Huntington Beach and keep you breathing easy. 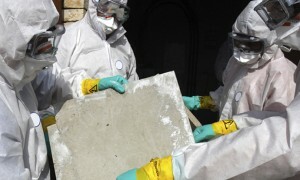 Although asbestos is theoretically safe as long as its fibers remain trapped within the matrix of the building material, whether it be a floor tile, a sheet of insulation, or a roofing tile, the truth is that eventually all asbestos materials degrade and become dangerous. Asbestos insulation near your HVAC ductwork is particularly worrisome. If the insulation begins to break down, harmful asbestos fibers can easily get sucked into cracks in your ductwork and spread throughout your home. Breathing in those fibers can cause serious health risks, especially with prolonged exposure. That’s why it’s often a good idea to remove asbestos duct insulation now, before it has a chance to degrade. If you’re not sure what kind of insulation you have, call in the experts from AQHI, Inc. for advice. If your insulation was installed before 1978, chances are high that it contains asbestos. Once you realize you have asbestos in your home, it can feel like you’re sleeping in a ticking time bomb. Fortunately, you can get the asbestos removed quickly and safely with a simple call to the experts at AQHI, Inc. We will send a team of trained and certified technicians to your home to handle the removal and decontamination process. We’ll leave you with a clean, safe home! Call us now to find out more. Our asbestos removal office for Huntington Beach CA is open Monday through Friday between 8:00 AM and 5:00 PM and closed for lunch from noon to 1:00 PM. With advance notice, projects can be scheduled for weekends, early mornings and evenings.